We last talked about the members of the Algonquin Round Table in November. and today we’re celebrating the birthday of one of the Round Table’s most famous members: Alexander Woollcott, who was born on this day in 1887. 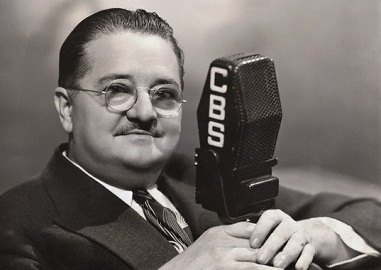 Woollcott was a drama critic, wit, New Yorker columnist and radio personality. Woollcott was highly influential in the New York theater scene and his reviews could either make or break a show. In fact, Harpo Marx would credit his own stardom to Woollcott’s glowing review of the Marx Brothers’ first Broadway show, I’ll Say She Is. Of course, having a reputation as a tastemaker often gives one a bit of an ego. According to his friend Edna Ferber, he often referred to himself without irony as “the best writer in America.” He also claimed to be the inspiration for some of his friends’ works. For example, he claimed to be the inspiration for Rex Stout’s famed detective Nero Wolfe, a claim that Stout denied. However, there is one work that we know Woollcott definitely inspired, the hilarious play The Man Who Came To Dinner. George S. Kaufman and his writing partner Moss Hart were both friends with Woollcott, but they also knew first hand how obnoxious Woollcott could be. One day, Woollcott showed up unannounced at Hart’s estate in Bucks County, Pennsylvania. He promptly took over the house, occupied Hart’s master bedroom and drove the household staff crazy. When Woollcott finally left, he wrote in Hart’s guest book, “This is to certify that I had one of the most unpleasant times I ever spent.” Hart soon told Kaufman about Woollcott’s visit and joked that he was lucky that Woollcott had not broken his leg, which would have left him stuck there. The two playwrights paused for a minute and realized that they had an idea for a play on their hands. As The Man Who Came To Dinner begins, the audience quickly learns that while on a speaking tour, famed radio host Sheridan Whiteside was invited to dinner at the home of Ohio factory owner Ernest W. Stanley. As he left that night, he slipped on a patch of ice, breaking his hip and forcing him to take up residence in Stanley’s home, creating havoc for Stanley and his family; especially when his famous friends (based on Gertrude Lawrence, Noel Coward and Harpo Marx) start dropping in. Woollcott loved the play and Kaufman and Hart actually asked him to play the lead role when the show debuted on Broadway. Alas, Woollcott’s busy schedule kept him from taking the job. However, when the play hit the West Coast, Woollcott jumped at the opportunity to play the role, and was even joined by Harpo Marx, who played the character he inspired; the comic actor named Banjo. Of course, a larger than life personality like Woollcott deserves a death just as mythic. On January 23, 1943, Woollcott appeared as part of a panel discussion on CBS Radio’s The People’s Platform. The topic at hand was Adolph Hitler, and about ten to fifteen minutes into the broadcast Woollcott boldly declared that “Germany was the cause of Hitler.” The debate went on, but Woollcott was oddly silent for the rest of the program. As it turns out, Woollcott had suffered a fatal heart attack. Amongst Woollcott’s many claims was that the Brandy Alexander was created in his honor. Now, there’s some disagreement about this statement. For one thing, there is a similar gin based cocktail simply called Alexander. Also, others have claimed that the drink was named after Tsar Alexander II, or that it was created in 1922 to celebrate the wedding of Princess Mary and Viscount Lascelles. Regardless, it is a delicious cocktail that’s a perfect blend of alcoholism and chocoholism. Shake all ingredients with ice and strain into a chilled cocktail glass. Garnish with ground nutmeg. Tomorrow: Hail to the chief.